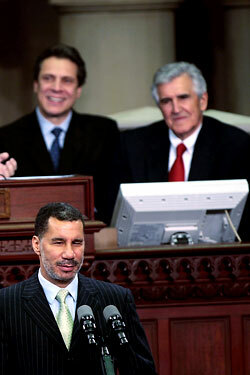 Governor David Paterson is sad to see Joe Bruno go — so sad, in fact, that he offered to give the former State Senate majority leader a highly paid “special adviser” post in his government. According to the Post, Bruno won’t accept the offer (he’d rather pursue a more lucrative private-sector gig). But it may indicate a few things: first, that Paterson is intent upon solidifying his support among state Republicans, and second, the governor isn’t afraid of slighting Senate Minority Leader Malcolm Smith. Having Bruno still exert power in the Albany would be a slap in the face to Smith, Bruno’s longtime rival, as Smith has a chance to assume the majority-leader post this fall if Democrats take control of the body. A source tells the tabloid that Paterson may not want the Senate to “go Democratic,” which seems a tad unlikely, given the legislative power Paterson would control if the entire state government were on the same team — and the reputation he would build if he were the first governor to break Albany’s legendary gridlock in 40 years. Also in the Post is a report on the high-profile tenants of the Lenox Terrace apartment complex in Queens, where U.S. Congressman Charles Rangel caught fire for having four rent-stabilized apartments earlier this month. It’s old news that Paterson is one of the handful of other public officials who live there and pay discounted rent — but the paper reveals just what he gets for his dough. In a building where market-rate two-bedroom apartments go for up to $2,750, he shells out only $1,250 for his. Damn, it’s good to be the governor. When you’re paying rent like that, it makes the Days Inn look like the Plaza!